Guns of August | Cry Havoc and Let Slip the Dogs of War! Reckoning for Lone Rock, A Pulp Alley Adventure! Yesterday afternoon found me off enjoying my local convention, guns of August, where I ran a Pulp Alley game of wild West Cowboy Action! This is the first time I have used Pulp Alley for a cowboy skirmish. I decided to use the Crime Spree adventure in the Vice Alley campaign book. This is of course designed for 1930s gangsters, but one of the greatest aspects of Pulp Alley is how easy it is to do whatever you want with it. Because I was playing at a convention I decided to allow 6 leagues (and therefore 6 players) rather than the usual maximum of four. Because I was allowing six players I decided to allow a larger playing area as well. Pulo alley is usually played out of a 3″x3″ table, but I decided to use a full 6″x4″. Again, borrowing from the notion of Vice Alley, all of my leagues were intended to be classed as criminal or vigilante. The leagues consisted of El Guapo and his banditos, The McBroom gang, Marshall Harris and the Pinkertons, Sheriff Silas and his Posse and of course Preacher Harris and his Evangelical Vigilante Suffragettes. I had planned a sixth league which of cowboys but I ended up with just the five players, that’s fine. I think in the environment we were ibn even five was probably too many. The game was a lot of fun. Some of my players had no experience with gaming at all let alone with Pulp Alley, and two were children ( though one of those was probably getting close to adulthood). Tonight was the first night of Guns of August 2014. 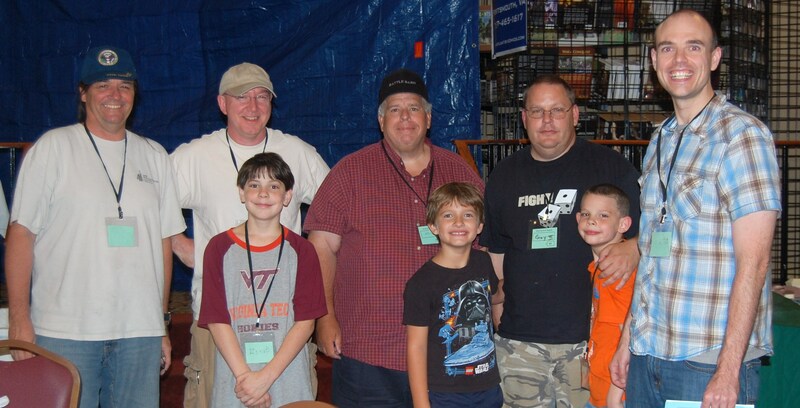 Guns is a local Williamsburg convention for historic wargaming though a few Science Fiction games are usually present as well. Not to mention Gnome wars. When I asked one of the organizers about the average attendance I was only told that 300 was the largest. I would image that the usual participation is probable somewhere between 200 and 300. 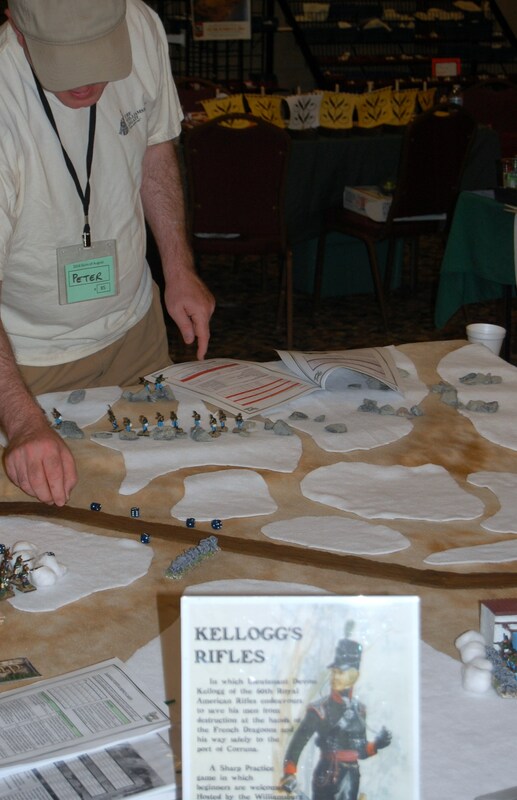 GoA is hosted by the Hampton Roads Wargamers who hold a similar though slightly better attended convention in February, Williamsburg Muster. 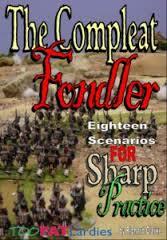 This evening I ran “Kellogg’s Rifles” which was basically “Fondler’s Rifles” from the Compleat Fondler, published by Too Fat Lardies. I altered the Characters and their names, as well as replacing the 95th rifles with the lesser known 60th, the Royal Americans. I had decided early on to play the scenario with a maximum of four players. The idea being that two would play the British Big Men (Kellogg and Hoffman) and the others would play the French. This was a less than perfect answer because for those readers unfamiliar with the tale, most of the French big men do not arrive until the fourth blank card. My players were Brian and Gray playing the French and Peter and Malcolm playing the Riflemen. All of the players except Brian are people I have known for a while. Two of them were somewhat familiar with the game. Gray had played a few time before, not as much as he would have preferred. Brian had only played solo games at home. He mad it very clear that I was looking forward to playing. 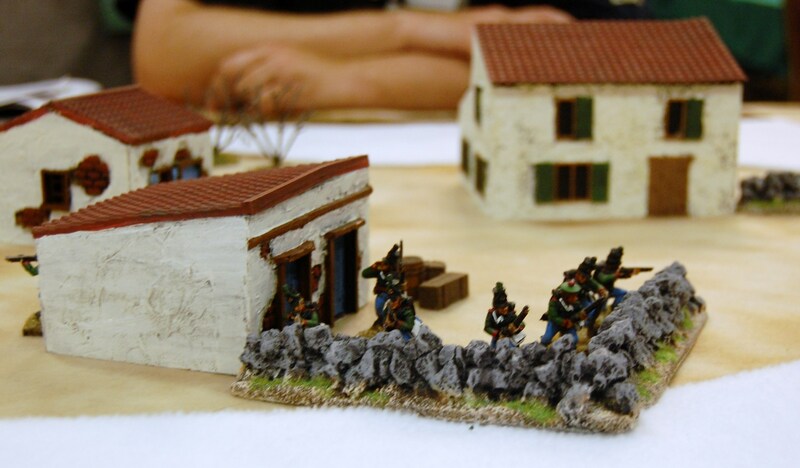 The scenario begins with the rifles running from an ambush by the dragoons and seeking cover at a small Spanish farm. 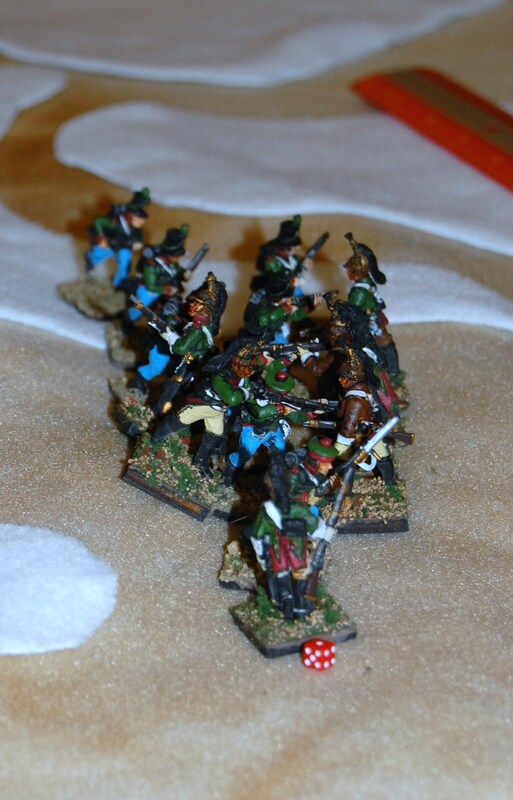 After getting a head start of two moves, the French dragoons came chasing behind them. French Sergeant Martin brought his two groups in formation onto the field and began to wheel towards the British Sergeant Hoffman’s men who were making there way to the cover of a stone wall. Unfortunately for the French this gave their flank to the two groups of Rifles taking cover in the broken ground of the hills north of the farm. Martin did his best to maintain order and to drive his men forward, but as a status I big man he lacked the initiative necessary for the cross fire he found himself in. Not to mention s number of turns in a row that ended before they began thanks to the unlikely repeat early appearance of the Tiffin card. Martin was forced to withdraw and even though I was charitable and allowed him to try to regain the bottle of his men while OFF the table, the Rifles made their way safely to Corunna long before the pother French men even arrived! The game lasted about an hour and a half and all the players enjoyed it. Even Gray whose big man hadn’t even made it to the table! As we were slotted for more time, and no one was going to be using the table we all decided to play again. For the second game however we made some alterations. I raised Martin’s status to 2 so that he would not be so flat footed, and we decided to shorten the arrival time of the other French dragoons to three rather than four. Peter and Malcolm switched the big men the were playing around, but the french players stayed as they were. For the second game the French decided to come on the table dismounted. They also came in separately rather than as a formation. 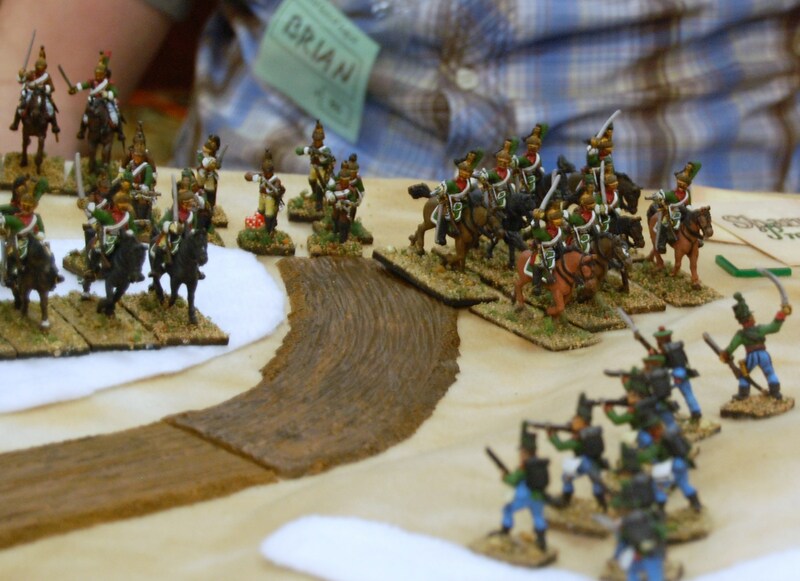 While this change of tactics was an improvement for them ( they did do more casualties to the British than in the first game) still things seemed to be working against them and again they were driven from the table and again I allowed them to try to regain their composure off table. 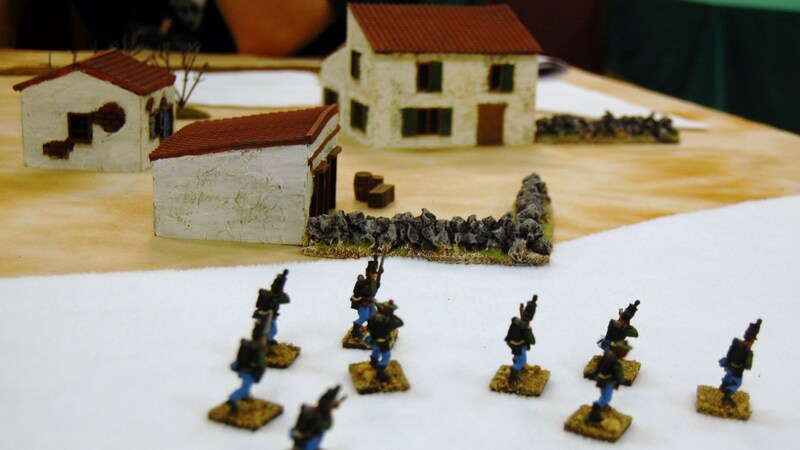 As in the first game, the British smelling victory began to move forward to the road to Corruna and safety, but here things changed. 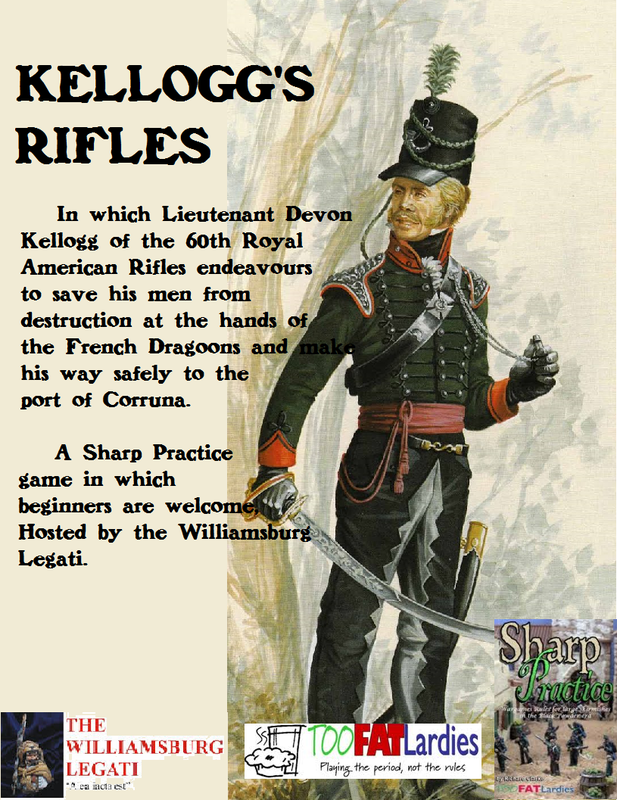 Col Laurent arrived attached to 3 groups of Dragoons under the direct command of Captain St. Pierre. The French Colonel raced one of these groups through the snow towards Hoffman’s men hunkered down behind their stone wall. The French charge struck home but the brave Rifles proved victorious and sent the Frenchmen reeling backwards again off the table. Hoffman’s Rifles celebrating their victory! Things were not going so well on the other flank however. 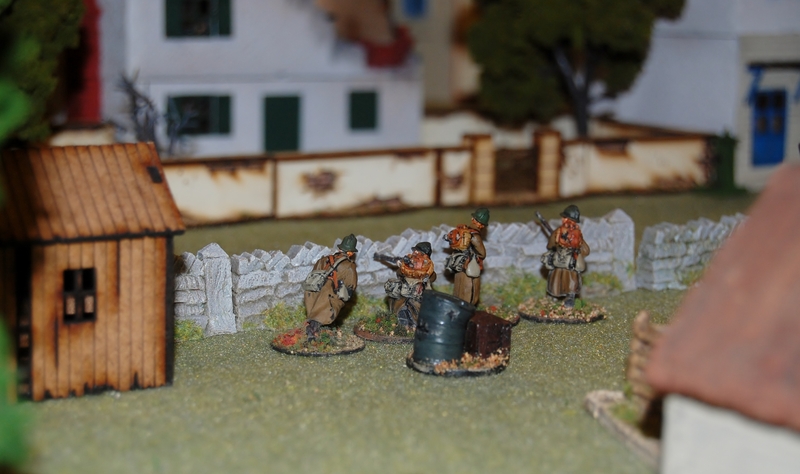 The riflemen who had made their rush to the road to Corunna now found themselves being charged by Capt. St. Pierre and another group of Dragoons. Taken completely by surprise Kellogg ran with his men, who retreated back to the cover of the rocky hill before the charge could reach them. Regaining himself he steadied the men and moved back to do the same for his reserves. The timing was disastrous. 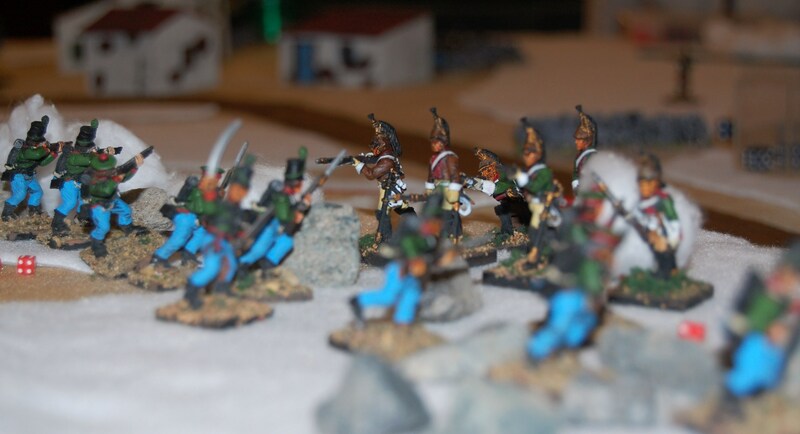 As he left the forward group the dragoons dismounted and charged this time on foot into fisticuffs. 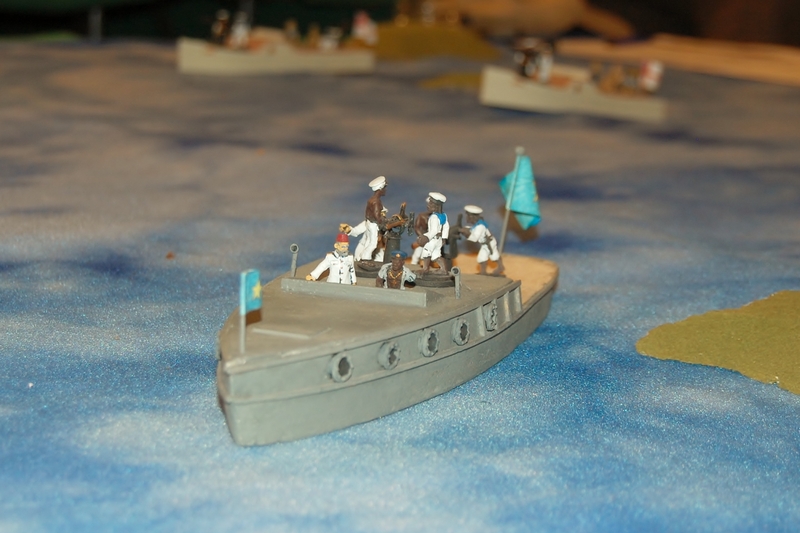 Finally, Sargent Martin had cajoled his men back into order and they returned to the field. Sargent Armistead continuing charging after the retreating rifles. Kellogg’s two groups by now had suffered so much punishment that they fled the field, disordered into the countryside. 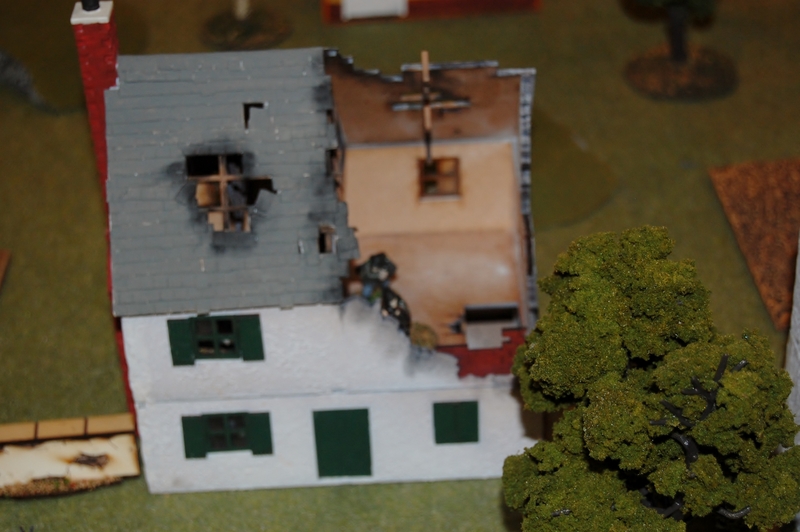 Hoffman’s men still held their own and were in good condition, but it was clear that they could not long hold out on their own. they retired from the field in good order. Overall everyone had a jolly good time and Peter has suggest that our club (Peter and I are both members of the Williamsburg Legati) should play it at the club. Tomorrow it’s Chain of Command.